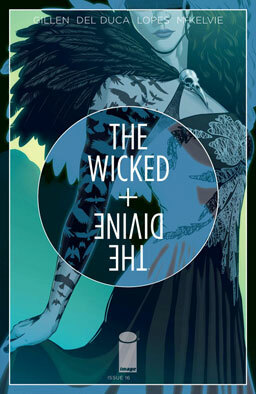 Our main focal character in this issue is the Morrigan, with Baphomet as the secondary focus. Morrigan is imprisoned inside Valhalla, and she remembers her previous life as a mortal. She used to be Marian, and Baphomet was Cameron, a couple of goth kids dating each other and playing live-action “Vampire: The Masquerade.” When Ananke chooses Marian as the Morrigan, Cameron is lost — until Ananke is persuaded to promote him to godhood, too. Verdict: Thumbs up. Loved getting to learn more about Morrigan and Baphomet, thought the LARPing segments were wonderful, and I really enjoyed Leila Del Duca’s artwork. Country-girl witch Emmy just recently met her big-city twin Kammi, who is a lot more evil than Emmy is. She’s roaming the county, meeting the various monsters and haints, and working to recruit them to her side. Emmy suspects Kammi is up to no good, but is she going to find any allies of her own before it’s too late? Verdict: Thumbs up. Kammi is an entirely horrible person. She goes out and finds the most awful critters in the forest, knows exactly what they want, and is probably a great deal scarier than most of them. Her picnic lunch in the woods, consisting entirely of rotting meat, is really something else. 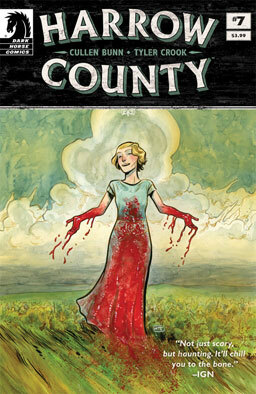 Yeah, this is the most fun, spookiest, creepiest horror comic on the stands today.